This fresh entry into Arthur Miller’s series “A Baseball Card That Never Was” features one of baseball’s greatest hitters. 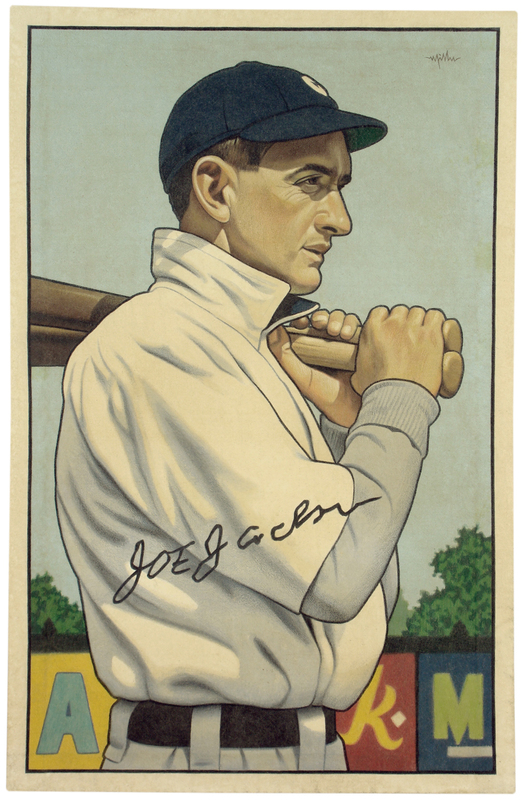 “Shoeless” Joe Jackson is portrayed in this stunning canvas artwork in the style of a 1952 Bowman card. Jackson is shown in a collared baseball jersey with a bat placed on his left shoulder. His black facsimile signature is printed on this artwork. This artwork is a mixed media on canvas. Specifically, the mixed media is acrylic enamel house paint, oil pastels and colored pencils and sealed with varnish. 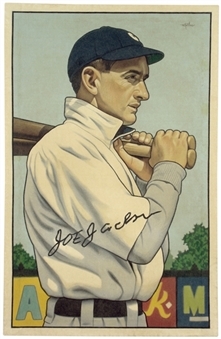 Written on the back of this 26 x 40-inch canvas artwork is "A Baseball Card That Never Was: Joe Jackson (1952 Bowman)", “2016”, and Miller’s signature. Miller’s signature is also present on the front of the artwork. This canvas artwork is an excellent display piece for any baseball fan!